In this 2019 review, we will look at some of the best sewing machines for children. It is important that children learn essential life skills at an early age. Sewing is one such skill. Sewing can be creative, fun, and easy to learn (at least the basics!). Learning to sew can give children the confidence to learn other important things as well. By learning to sew, they will develop self-esteem since sewing is considered as a grownup activity. This is a very compact sewing machine that is as adorable as your children. At the very first glance, it appears to be perfect for budding young crafters. This is a ¾ model and yet it is fully functional. There is a free arm as well as a carry handle to make it highly portable. At just 11 pounds, it is not just portable but easy to handle and stow. This sewing machine provides 11 stitches which also includes 2 stretch stitches. A built-in buttonhole is also available. It can also be used as a quilting machine for first-time young crafters. The design is outstanding and very eye-catching. It is sure to captivate young ones and will really motivate them. The color is simply fantastic and makes it look very unique. Smooth contours make the machine visually attractive and easier to handle. The colorful design is simply adorable. This colorful contraption will in fact even intrigue grownups. The nearly jade-like aquamarine color gives an exotic look and high aesthetic appeal. It comes with the high standard and durability that is the hallmark of Janome. ¾ size model – this is just about right for children! This is not just a toy but a fully fledged sewing machine that can be a very helpful learning tool. It may not have as many features as more advanced versions but then this is just a basic machine. It has enough features to help children learn a lot about sewing. And since it is so dainty and pretty, it will look perfect in your children’s room. This sewing machine is great for developing skills of children who are interested in fashion. The included LED lighting provides a high level of illumination that will make sewing easy. With such high visibility, seeing design patterns even on dark fabrics is now a cinch. This will allow your children to get error-free and better results. With the bright built-in LED light, you won’t have to worry if you have to work in a dark area. This model is quite sophisticated and will provide couture-class stitching that will fascinate your children. This is possible thanks to built-in 50 stitch selection options. You can choose from quilting, heirloom, clothing and decorative stitching. The free arm feature will allow you to easily sew sleeves and cuffs. The maximum sewing speed is a mellow 850. With such medium speed, it will be easy for your kids to make impeccable high-fashion sewing projects. There will be no problem with speed control. 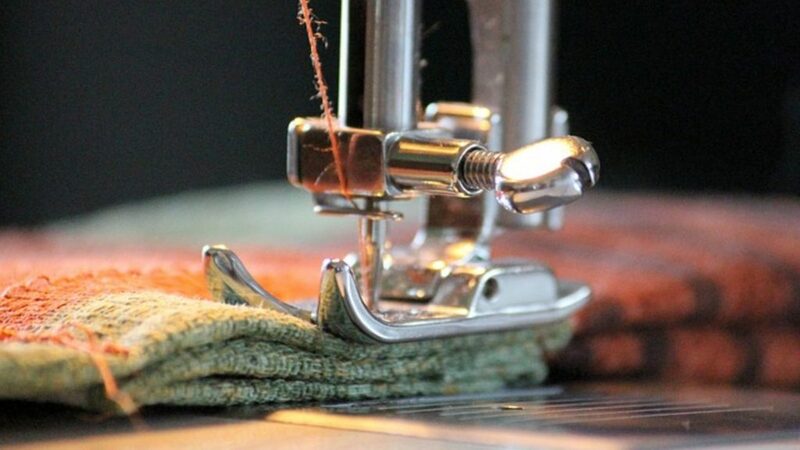 The machine comes with several very useful accessories like six specialty feet, finishing solutions, designer sewing solutions, and special-purpose needles. You can now make use of a wide array of designer features for zippers, blind hems, sew-on buttons, overcasting edges, knitting, flexible fabrics, topstitching, and much more. Thanks to a generous selection of features, you can gain the designer edge. For instance, you can use the zipper insertion stitch and the zipper foot to create even and neat stitching near the edges. The overcasting stitch and the overcasting foot will give you clean edges with serge-like quality, making it ideally suited for knit and home décor projects. You can also make customized buttonholes that look elegant and professional with the help of five one-step buttonholes that can be scaled automatically according to your button size. Threading is easy and reliable for both bobbin and top thread to produce high-quality and consistent stitching. 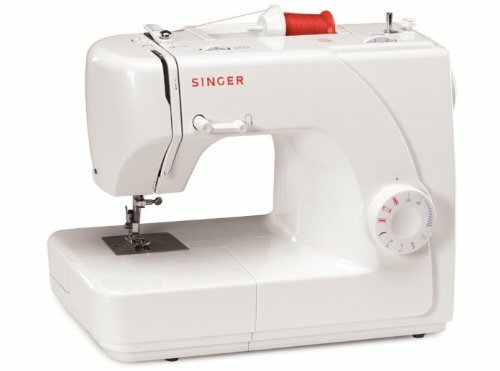 Your children can now dabble in haute-couture sewing projects using this computerized sewing machine. With the Brother Project Runway CS CS5055PRW, making high-end fashion projects is now economical and affordable. It has been designed to be intuitive and easy to use and learn. With this sturdy machine, stitching and sewing are virtually effortless for a wide variety of fabrics. Threading is now easy, quick and hassle-free with different kinds of threads. The automatic built-in needle threader will accurately push the thread through the eye of the needle at just the press of a lever. For easy reference, the different kinds of stitching options have been neatly printed right at the very front. Stitch selection is so easy thanks to the intuitive and easy to use LCD screen where you can conveniently dial in your choice. The display shows the current stitch selection, the width and length of the stitching, and it is also capable of recommending the right type of foot that you should be using for your stitches. Since the machine is computerized, you won’t have to bother with complicated multiple dials. As with all Brother products, this sewing machine is made to inspire confidence through user-friendliness. The machine comes with an easy to understand user manual in both English and Spanish. There is also a limited 25-year warranty. Since it is so compact, it will be easy for your children to carry the sewing machine to their class and also from room to room. With this sewing machine, your children can truly make a high-class fashion statement. And won’t that make you proud? 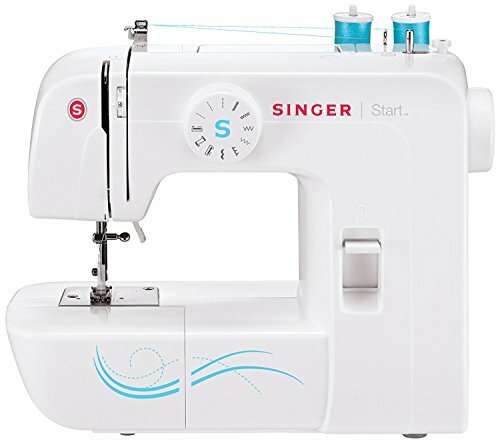 Singer is one of the most trusted and recognizable brands for consumer products and sewing machines in particular. It is known for its remarkable innovations like the first ever computer controlled sewing machine and the first zigzag sewing machine. In fact, the owner Isaac Singer founded the company in 1851 with the help of a patent for the world’s first workable sewing machine. As the name suggests, this sewing machine is great for children who are just starting to learn the basics of sewing. The machine provides a selection of six basic stitches that can be chosen very easily with the help of the dial. Selecting stitches is therefore very simple. Since the stitch width and length are predetermined, beginners can avoid guesswork making this sewing machine ideal for novices and hobbyists. You can embellish any of your creations from the stitch choices. For basic sewing, you can opt for the straight stitch. Zigzag stitch will help you to create a simple appliqué. With the blind hem stitch, you can mend a hem. The decorative scallop stitch will add an artistic touch to your work. Although modest, the stitch selection options cover a fairly wide range of sewing projects. With the four-step buttonhole element, you can create buttonholes in just 4 simple steps for stuff like pillows, casual clothing, high-fashion garments and more. The removable extension table can be conveniently detached so that you can easily use the free arm for hemming sleeves and trousers as well as other sewing projects. This sewing machine has a small footprint thanks to its compact dimensions. It can be easily stored and carried anywhere you like. The internal mechanism is very sturdy and well built which allows for skip-free stitching and long life. This machine can serve you well for many years to come. 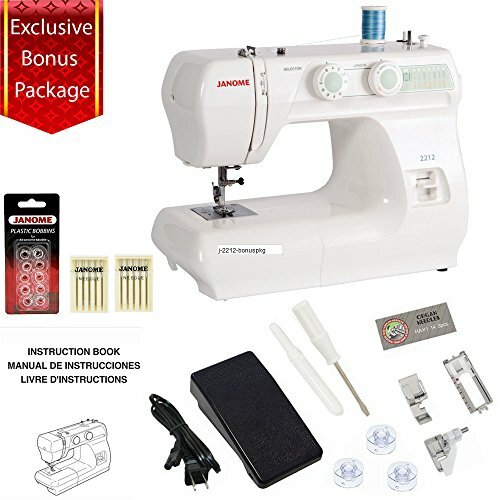 This is a wonderful entry level sewing machine for beginners, hobbyists, and children. The extra high presser foot lift allows you to raise it by an additional ¼ inch so that you can easily sew thick fabrics and other types of difficult materials. You won’t need heavy duty sewing machines if you want to do curtains and other thick fabrics from time to time. This machine will do the job remarkably well. You can conveniently customize your stitch width and length. You can set up a maximum stitch width of 5 mm and a maximum stitch length of 4 mm. Making buttonholes is a very simple process thanks to the four-step buttonhole feature. At a very affordable price, it offers a wide range of capabilities which should be sufficient for hobbyists, children, and others who do not intend to use the sewing machine every day. 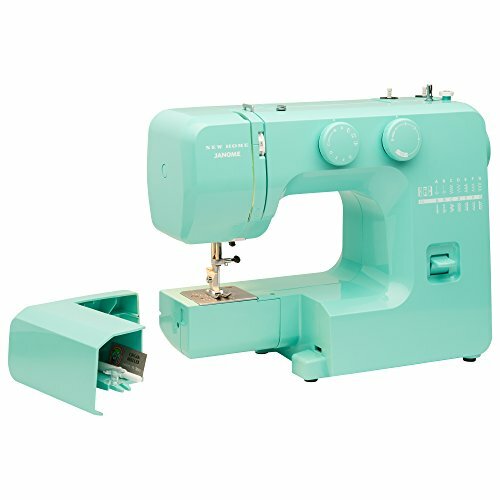 This machine is very reliable and sturdy so that your thread won’t snap while you are sewing. This is an annoyance that can occur frequently with other types of sewing machines. You can go up to 1000 stitches per minute which is quite reasonable for stitching speed. 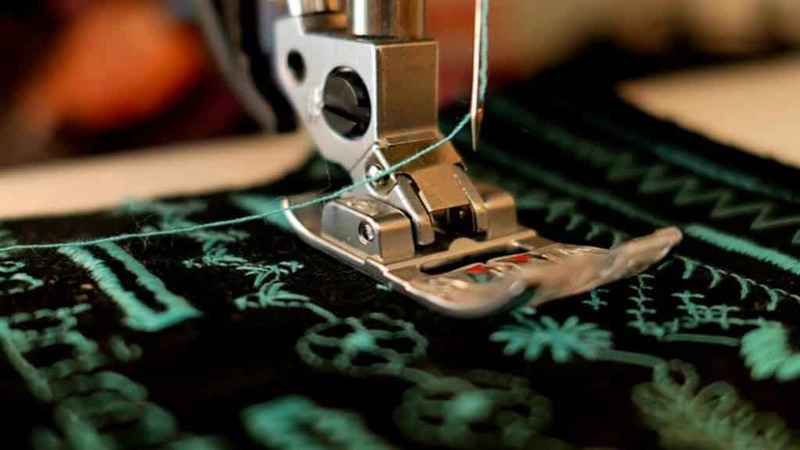 With medium speed, you will make fewer errors in your sewing work if you are a beginner. And yet this machine is fast enough for basic users. The table area is wide enough for basic quilting work and the drop feed will facilitate free motion sewing. The compact size means that you will not have to dedicate a lot of space for this machine. You can easily store it when it is not in use. You can set it up fast and plug it in to use the machine immediately. It doesn’t have lots of fancy features. But it will prove sufficient for basic work and in particular, it is good for introducing the art of sewing to children. Singer 1507WC Price: "Right out of the box, I was able to go straight to work and alter a few pairs of pants. I really like this Singer Sewing Machine"
Children and beginners can learn sewing easily with this sewing machine thanks to its ease of use and simplicity. This machine will also accommodate those who intend to use it from time to time for basic sewing and mending work. This machine has been designed for learning purposes and will prove to be adequate for basic sewing projects. A number of design features have been included to support learning. The machine is small, lightweight and portable so your children will have no problems taking it to their sewing classes. The machine also has a carrying handle to make it highly portable and a canvas cover as well to protect it while it is being carried. A compartment has also been included to allow storage of accessories. The following accessories are provided: standard presser foot, four bobbins, needles pack, zipper foot, button sewing foot, buttonhole foot, feed dog cover, oil bottle, lint brush, seam ripper, screwdriver, stitching guide, and two spool caps. Children will also be able to pick up their simple features in no time. Different kinds of basic projects including decorative work can be covered thanks to its basic options. Eight built-in stitches are available which can allow children to do a wide range of sewing work. 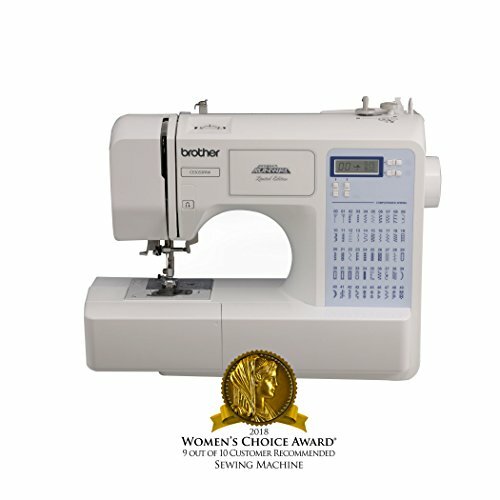 You can select any model from the list of best children’s sewing machines to teach an important skill to your kids which will be helpful for them in life. It will develop confidence and will stimulate their willingness to learn and discover. 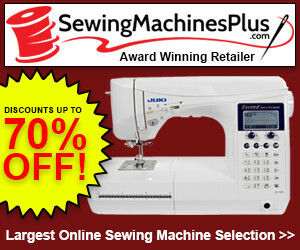 These sewing machines are affordable, reliable, compact and efficient. Just think what an ideal present a sewing machine will make for children. Get one today!